The fire jumped the far ridge while I was watching last night. It's one valley closer now. Still a few valleys to go but the trend isn't looking good. Winds are from the NNW until Thurs. night when they swing around to W and then SW then SSW and back to WSW by Saturday. This is not good. It appears the crews are letting the interior burn while they tackle the fronts closer to the coast. I understand the logic but the Indians Fire near Fort Hunter-Liggett is now at 53,000+ acres in a little more than a week. Double Cone looks like an erupting volcano 6/25/08, 5:48 PM Fire ground crews got some additional aerial support today. 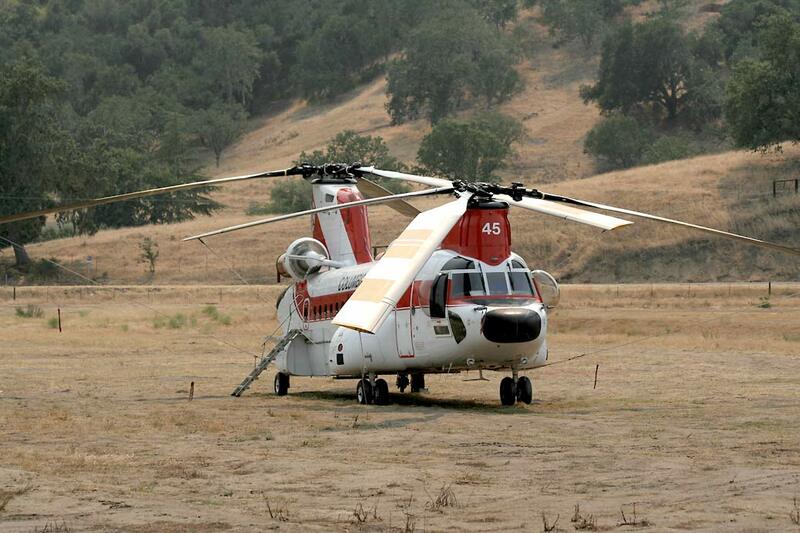 Looks like two Bell 412s and two Boeing 234/CH47 Chinook heavy lift twin rotors carrying 1,000-3,000 gallon buckets from the reservoir into the interior. Fun to watch, if you don't think about what's really going on as far as your own ultimate safety is concerned. A Boeing 234/CH47 Chinook and two Bell 410s at the Helibase Panorama on 6/25 6/27/08, 2:47 AM The Governator arrived for a short visit yesterday and is calling for air reinforcement from Oregon and Washington. We need some big tankers to drop suppressant. San Diego ground crews have probably arrived by now. Bet that was a long trip; all the way up the coast in a fire truck? They'll be exhausted before they get here. Wind has shifted around to the south for the next few days, We're in heavy smoke, which is not good for Joy at all. She can't take anyone smoking a cigarette tens of feet away. She'll probably have to wear one of our respirators that we use for working the glass while outside. Temps are going back up tomorrow, so it's not going to be fun and, with all the smoke, we can't keep tabs on the advance of the front very well, if at all. The pilot's will have difficulty seeing to get into the reservoir and back out again. It's down in a steep canyon and directly in the path of the smoke. 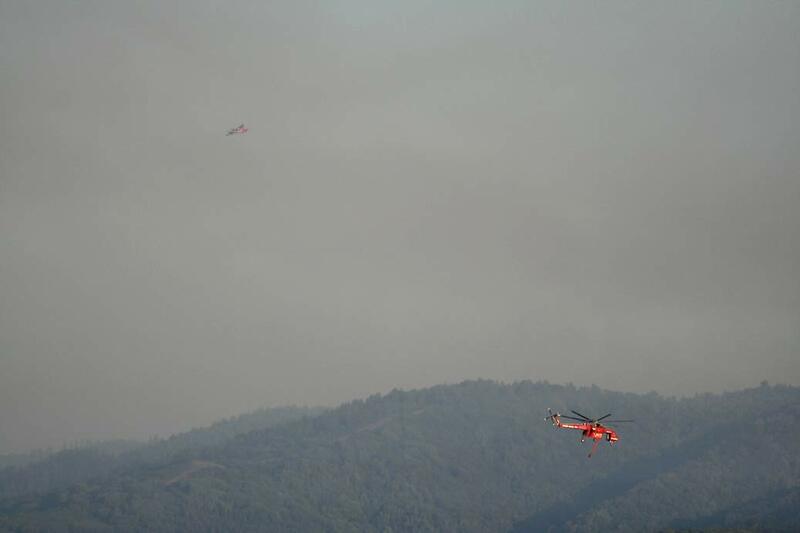 The buckets hang pretty far from the choppers, so they have to climb a long ways to clear the ridges and begin heading to their destination to drop. They've been flying a good pattern in and out of the reservoir, sometimes The Chinook will have to slow down and hover a while because he came up behind the Bell still filling his bucket. 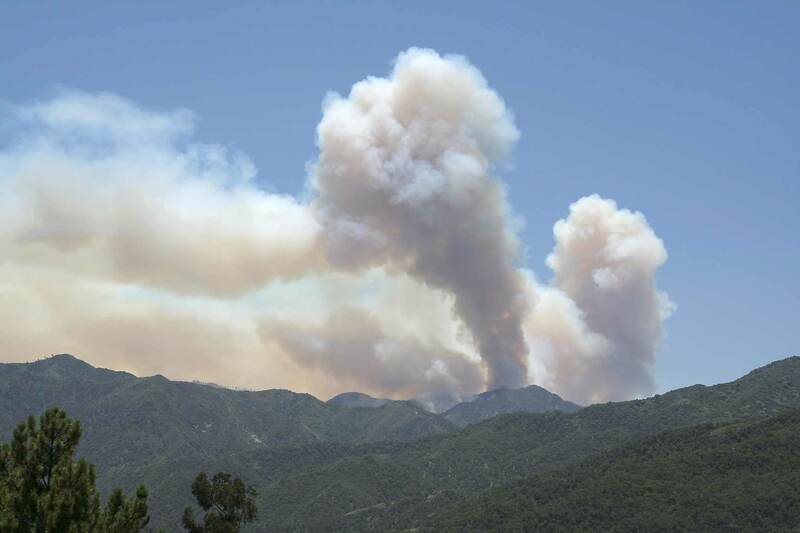 7/4/08, 12:19 PM You probably have read or heard on the news about Big Sur evacuating. There have been evacuations ever since the fire started but this one was in an area that the forces thought would not be directly in harm's way. Huge bulldozers have been cutting dozer lines on the ridge tops for more than a week; some following dozer lines that have been there since the previous fires 20 and 30 years ago. One crew did 21 miles in three days! On a Cat? A local Air Support base is set up and growing. 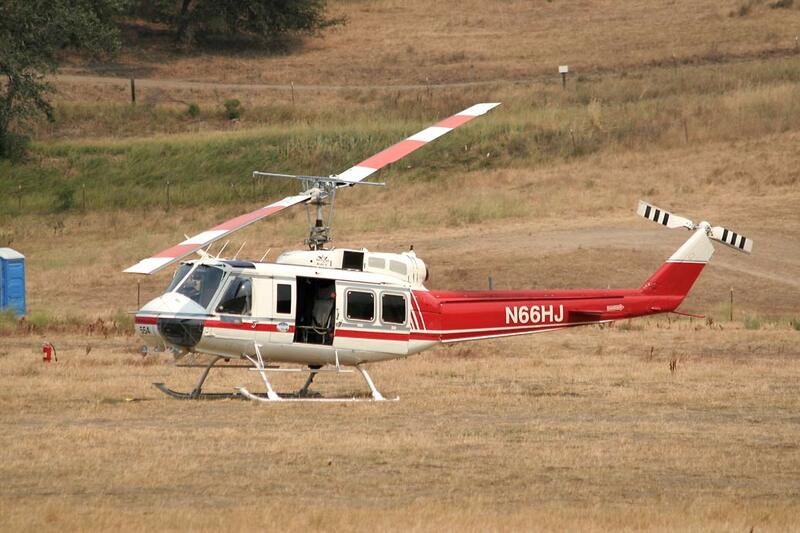 Heliport is down the road a couple of miles and tankers are based at Monterey Airport. 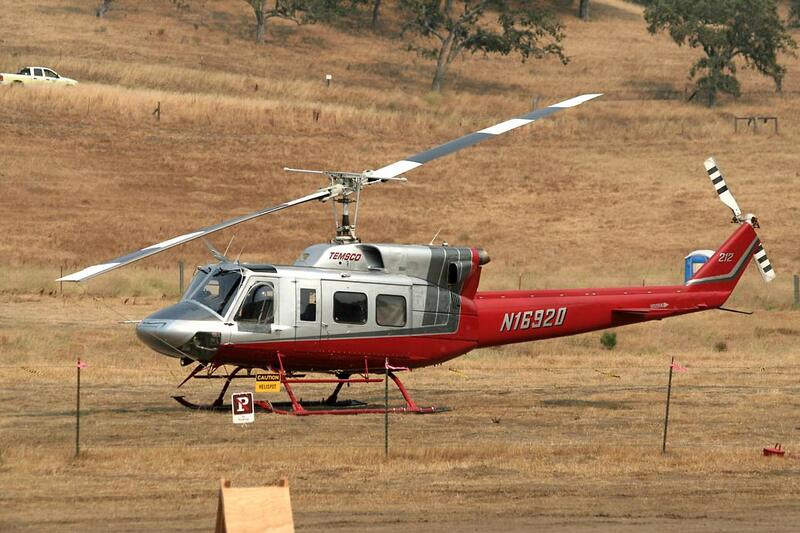 With the new heliport, there's at least one Sky-Crane and a few Huey Cobras added to the force. I keep wishing I had my rotary wing ticket, so I could go help. One of the pilots reported that he did 103 buckets in one day out there. 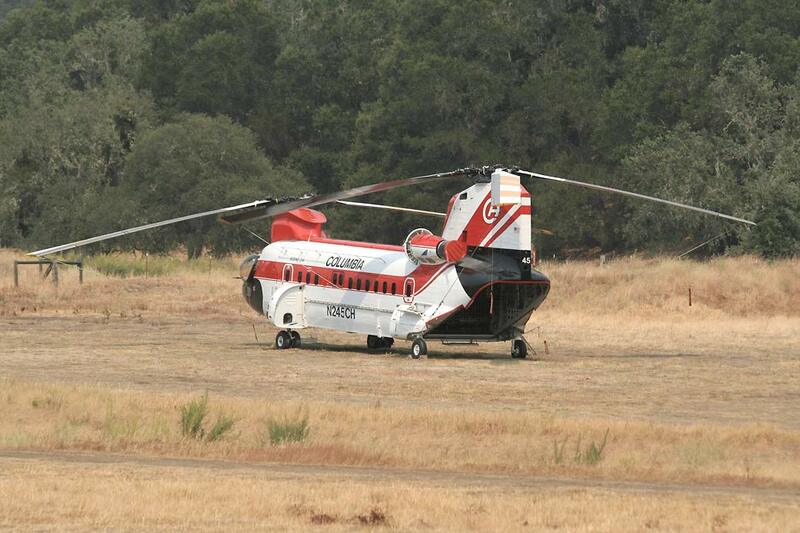 The radial engine bomber and a Sky Crane Being a national forest, the forestry guys are driving the plan. They'd prefer to let it burn and contain it at the dozer lines by setting backfires, rather than trying to get in there and actively fight it. Yes, the terrain makes it difficult but the overall logic is; it burns now, so it won't burn later when the available fuel mass will be larger. This is fine if your home and business isn't in the way. The problem with this plan is that evidenced in the national news reports. The fire jumped some of the dozer lines and got away from them; prompting the evacuation of the area they thought was secure. The smoke plume that day was ominous. The raging glow upon it that night, scary. So much for that plan. I'll bet they won't change, though. To that end, we are installing 10,600 gallons of water storage tanks, two 6.5 HP Honda OHV engine-driven 150 GPM @ 55 PSI pumps, 600 feet of fire hose in 100 foot sections, 26 RainBird gear-driven rotating irrigation sprinklers; 8 covering the roof of the studio and a wide perimeter, 10 on the south perimeter fence, 2 on the entrance gate, 1 on the small shop, the rest in 2 lines of movable RainBirds in areas between the fence and the studio, Nomex fire suits, helmets, boots & gloves. We already have goggles and respirators for the glass work. We have a crew cleaning the fuel out of the property and cutting the remaining fuel on the portion of the property outside the close perimeter fence; including all of Observatory hill next door. We're not messin' around. The fire sure won't. Cal Fire came through a few days before the fires started and gave our place a clean report but we're doing the above anyway. We'll have enough to do without having to worry about a pile of cuttings and standing weeds that could just as easily be gone. This whole plan is expensive but it's our only choice. 7/4/08, 7:43 PM This afternoon, I spent some quality time individually with each of three of the four Engine Captains from different houses in the L.A. County Fire Department that have come here to guard us. I told them of our qualifications, what we have planned, our equipment and its configuration, so they know what to expect, and how we see the situation developing. They all were rather surprised at the engineering and thought level and confirmed that we have a good plan, the property is in very defensible condition, having limbed up trees and cleared out all fuels, and that they are now better prepared to help us if it gets bad. I briefed all three of the local wind conditions that do not show up on the NWS wind rose plots, so that they now know what to expect when the wind suddenly turns each evening, blowing strong in the exact opposite direction from which it has blown all day—straight up the mountainside from the south (that's where the fire is), and won't get trapped. Being new to the area and having information on where stuff is that they my need on a moment's notice and what the local conditions are can make a big difference when it comes down to crunch time. If the front arrives in the evening, we are going to be in for one hell of a fight. My stomach muscles have relaxed just a bit—for now. Each step we take makes a difference. I'll undoubtedly wish that I could record it all on film but, just like when I was more active on the racing team, work takes precedence and those images will only be recorded in my temporal memory.